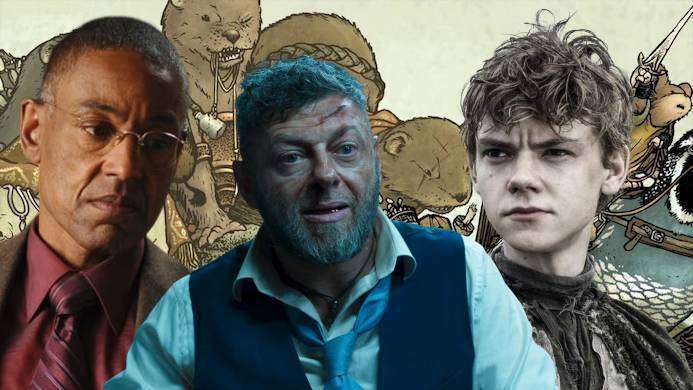 The cast for Mouse Guard, the forthcoming adaptation of the long-running, creator-owned comic book series of the same name, is well underway, with today's announcement of three major roles, including motion-capture legend Andy Serkis and The Jungle Book and Breaking Bad star Giancarlo Esposito. The Hollywood Reporter broke the news today that Serkis and Game of Thrones actor Thomas Brodie-Sangster have signed on to play the leads on the Fox project, which is being directed by Maze Runner filmmaker Wes Ball. The Eisner Award-winning graphic novel by David Petersen, is a set in a medieval world and tells of an order of mice who are the sworn protectors of their realm. That Hashtag Show reports that Esposito has also joined the film’s cast in the role of Conrad, "an older mouse, who after a life of adventure on the high seas, joined the Mouse Guard as a member of their seaside outpost, Calogero." Serkis will play the villainous Midnight, and Brodie-Sangster the heroic Liam. The film will have a sizeable budget and use the same WETA technology that was used to bring the apes to life in the most-recent Planet of the Apes trilogy to recreate the animals from Petersen’s world. Ball went on to say that he’s committed to maintaining the grounded, realistic tone of the comics. Mouse Guard has Dawn of the Planet of the Apes and War for the Planet of the Apes director Matt Reeves on board as a producer, which should help Ball achieve that same tone for Mouse Guard. Gary Whitta is writing the script. 20th Century Fox is producing. Are you ready to see Mouse Guard on the big screen? Let us know what you think in the comments!